The Prefecture of Heraklion is located in the centre of the island and consists of seven sub-prefectures: those of Temenos, Viannos, Malevizi, Pyrgiotissa, Kainourgio, Pediada and Monofatsi. The capital of the Prefecture – and of the Temenos sub-prefecture – is Heraklion. With a population of more than 250.000, the Prefecture of Heraklion is the most densely inhabited part of the island. 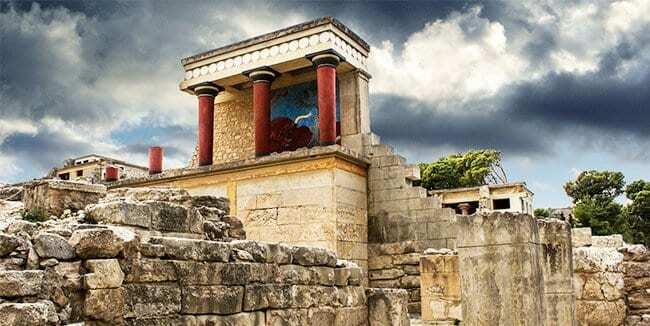 The fact that the most important Minoan Sites (Knossos, Phaistos, Malia, Gortys & Tylissos) and the best Cretan Beaches are located near Heraklion, this area is very popular for tourists. The region of Heraklion is a place of great contrasts. There are extensive plains (Messara), tall mountains, cypress (and oak) forests, lower hills with orchards of fruit trees, long sandy beaches, and beautiful sheltered coves. The history of Heraklion is reflected in the way in which its name has changed through the ages. According to Strabo, it stands on the site of what was in antiquity one of the ports of Knossos, known as Herakleia. Later, in the Byzantine period, it was known as “Castro”, a reference to some fortress or fortification on the site. But the city’s real history starts in 824 AD, when the city was taken by the Arabs. It was them who fortified the old settlement of Herakleia – Castro and dug a moat round it. It was from this moat -“Handax” in Arabic- that it took the name that it kept until the 19th century. Handax served as a base for the pirate raids of the Arabs, but it was under Venetian rule (1204-1669) that it reached the peak of its prosperity: now known as Candia, it became the most important political, military, commercial and social centre of the entire island. During this period it was fortified by its overlords with new, strong walls, the so-called Venetian walls, and adorned with handsome buildings, squares, churches, monuments, and fountains. This was also the period when literature and the arts flourished in Heraklion, partly because of influences coming from Renaissance in Italy and partly because on the Fall of Constantinople in 1453, many men of letters and artists took refuge in Crete. The city was surrendered to the Turks, after a 21-year siege, in 1669, when its name changed to “Megalo Kastro” (“The Great Fortress”). The presence of the Turks gave the city an Oriental appearance. The conquerors repaired the buildings which had been damaged, built new ones, converted the churches into mosques, and repaired the walls. During these dark days of slavery, the city lost its former prosperity. In 1828 and 1898 there were major massacres of its population, but in 1913, together with the rest of Crete, it was finally incorporated into the Greek state. Heraklion has developed into a modern city and into the commercial, industrial and agricultural centre of eastern Crete, handling a wealth of excellent products which include grapes (sultanas) and various kinds of table grapes, such as the razaki variety from Archanes. The sultana is a “pale green”, oval seedless grape variety also called the sultanina. The city is the capital of the Prefecture of Heraklion and since 1972, of the whole Crete. 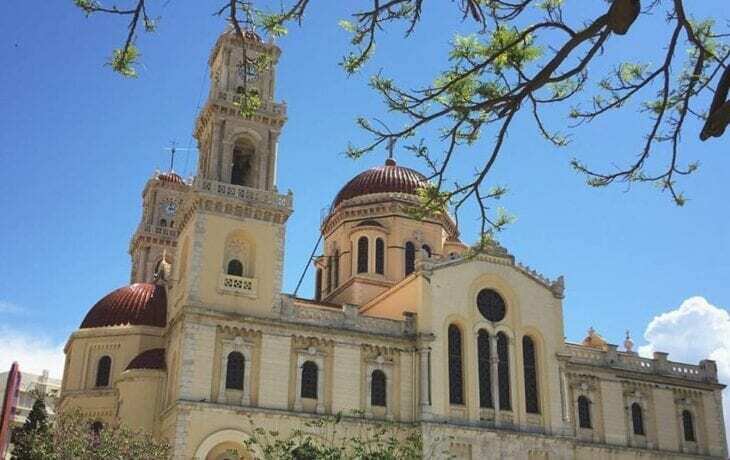 It is also the ecclesiastical “capital” of the island. 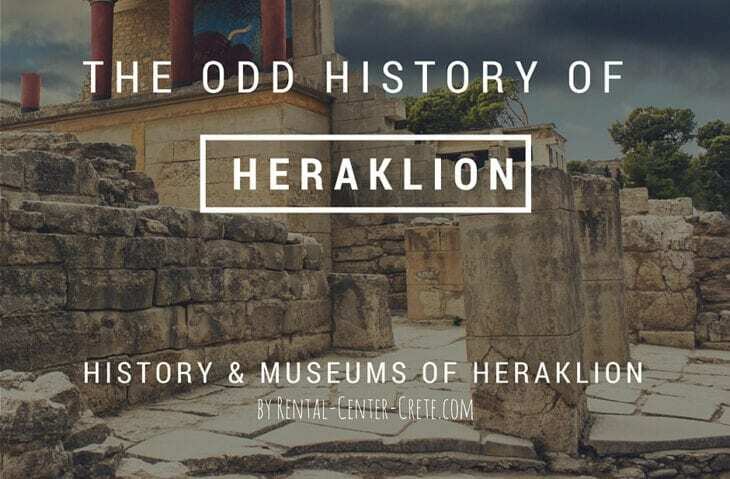 Heraklion has long been a cultural centre for Crete and has produced important figures in painting and literature, such as the famous Domenico Theotokopoulos (“El Greco”), the great novelist Nikos Kazantzakis and the historian Yannis Mourellos. Heraklion has grown rapidly and now has a population of 125.000, making it the island’s largest city. However, the fact that building has been largely unplanned and chaotic has meant that it faces the problems of the large modern city: traffic problems, and a lack of parks and open spaces. The city as such is not, then, of any great interest, with the exception, of course, of its Archaeological Museum with its wonderful collections of antiquities which have been dug from the soil of Crete. The most famous of the Minoan sites await our exploration close to the city. The Archaeological Museum of Heraklion is housed in a two-storey building in Xanthoudidou Str, on the north-eastern side of Eleftherias Square. It has 20 rooms and its exhibits come exclusively from Crete itself, covering a period from Neolithic Age to the end of the Helleno-Roman period (4th century AD). The Historical and Folklore Museum is in a building which was once the residence of a great benefactor of Crete, Andreas Kalokairinos. The continuity of Cretan culture can be traced though its collections, which are arranged chronologically and by subject-matter in the rooms of this three-storey building. The Historical Museum of Crete in Heraklion. It presents a comprehensive view of Cretan history from early Christian times to the present day. The original goal of those founding the Historical Museum of Crete was to collect and preserve valuable archaeological, ethnographic and historical material deriving from the medieval and modern periods in Cretan history. The Natural History Museum of Crete , also, in Heraklion. It operates from 09:00 to 20:00 on weekdays and 10:00 to 20:00 on weekends. The museum is located near the port of Heraklion, at Sofokli Venizelou Str, and it is dedicated to the natural environment. The museum was established in 1980 under the supervision of the University of Crete. The St Catherine Collection of Byzantine Icons, also called the Museum of Church Art, is to be found in the 15th century Basilica of St Catherine, in Agias Ekaterinis Square. It contains artefacts used in Christian worship: icons, wood-carvings, wall-paintings, manuscripts and ecclessiastical books. Of particular interest are six icons by the Cretan icon-painter Michael Damaskinos, dating from between 1582 and 1591.